Now Reading: Just how high will 2014 yields go? Earlier in July, the USDA projected a record national average corn yield of 165.3 bu / acre and corn prices continue to slide towards $3.50. The market is certainly not wrong to be bearish, but is its pessimism justified? We will explore this question in several parts. First, in this post, we’ll provide an overview of this season’s weather and the events to watch for in the remaining weeks. Then – over the coming weeks – we will look at local weather and yield trends to try to figure out just how high yield might go. To begin, it helps to understand how our weather model works. To generate insights into how the season is unfolding we start at the field level. For each field, we record local weather and agronomic conditions – such as accumulated rainfall, soil temperature and crop growth stage. Our model then looks at what happened in each county and runs a series of simulations based on 30 years of historical weather to forecast what might happen for the rest of this season. It allows us to see how the weather might unfold if this season were similar to previous seasons. What kind of year is 2014? It helps to think of 2014 in terms of previous seasons in recent memory. For this analysis we chose two extreme years – the drought of 2012 and the largest yield in recent history of 2009 – to see where the 2014 crop might end up. 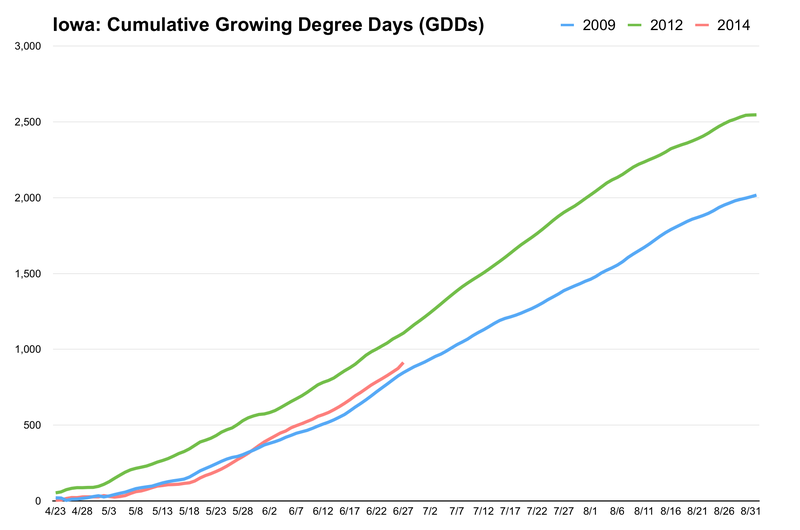 First, if we look at accumulated growing degree days (GDDs) across Indiana, Iowa and Illinois during the growing season, we see that there isn’t much difference between 2009, 2012, and 2014. From our analysis, at this point in the season, it seems unlikely that the 2014 crop will suffer from a lack of accumulated heat units. 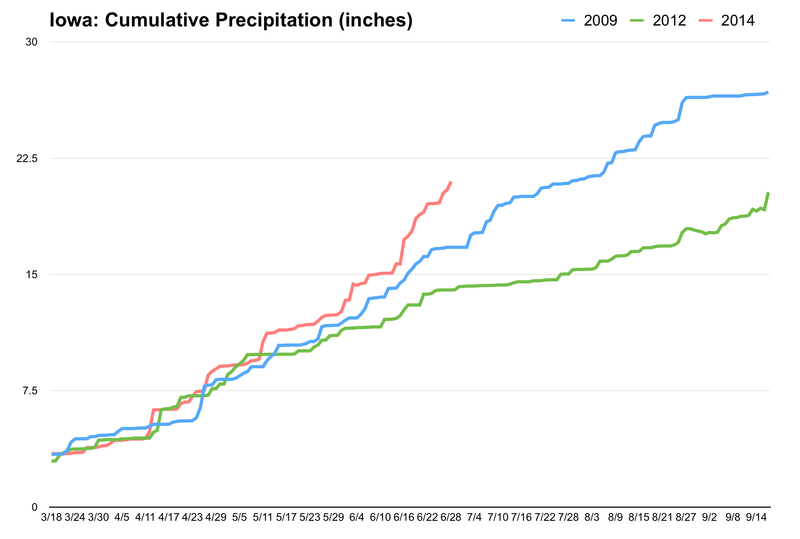 But if we look more closely at precipitation, and at Iowa in particular, it’s clear that this year is likely not going to turn out like 2012. 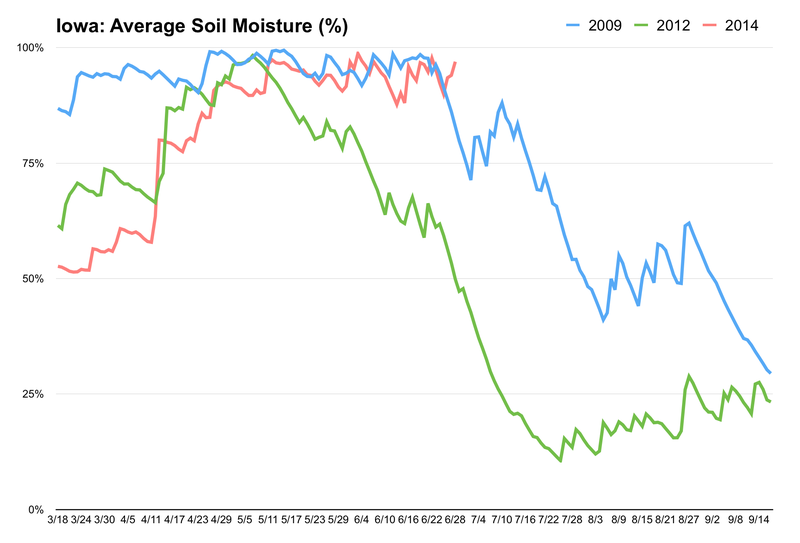 First of all, 2012 started out with sufficient soil moisture which allowed growers to plant early. The crop emerged nicely but very hot temperatures combined with a lack of precipitation depleted soil moisture very quickly hampering crop growth at stages v6 – v10. As a result, many growers saw weak plants and fewer ears. These conditions were then compounded by a lack of rain and soaring temperatures across the corn belt during critical reproductive stages. Luckily, given the favorable weather conditions to date, it seems that 2014 is almost certainly not going to be a repeat of 2012. At present, all factors seem to be progressing nicely – good levels of soil moisture, a positive GDD trend, and temperatures near the optimum. What are the major outstanding risks? Too much rain: rainfall is currently above the 15 year county average. At present, our forecasts do not predict too much moisture; however, NOAA has recently predicted a 70-80% chance of El Nino conditions later this year. It is hard to say how this will impact the corn belt but past experience indicates El-Nino’s tend to favor wetter and cooler summers and falls. Short fall in GDDs: lower temperatures in the next few weeks would provide optimal conditions for silking and other key reproductive stages. However, unseasonably cold temperatures could damage the crop. Drought during grain fill: if there were a shortfall in rain, some areas – such as Indiana – might see very low levels of soil moisture. As grain fill uses a lot of water, yields could be affected. This is one to watch if your area is particularly dry. In sum, if we can avoid any additional moisture and temperatures stay optimal, it seems quite likely that we will hit the USDA’s 165.3 bu / acre forecast.